Who should Tories choose to win them the next election? March 29, 2019, 12:00 a.m.
Theresa May has said she is willing to resign to get her withdrawal agreement passed - which of course would lead to a Conservative leadership election. The choice will hang on two questions: who will best satisfy Tory Brexit aspirations - and, a very different angle - who would be most likely to win a general election? One idea being floated last weekend was that a temporary leader could take over to complete the Brexit process, given the urgency of the ongoing Brexit process. The public are definitely open to the idea, with 44% saying they would rather a temporary leader, and just 25% saying they would prefer a leadership contest and a permanent leader. Conservative voters break 52% to 29% in favour of a temporary leader. As for winning an election, 28% of the public think Boris Johnson would make a good Prime Minister, putting him some distance ahead of his two closest rivals, Sajid Javid and Jacob Rees-Mogg, who are both on just 19%. The leading trio are followed by Michael Gove on 16%, Jeremy Hunt and Andrea Leadsom on 13%, Dominic Raab on 10%, and David Lidington on just 7%. However while the most people say Boris Johnson would make a good Prime Minister, this is partly a factor of him being the most well-known - which means he also has very high negatives: 54% think he would make a bad Prime Minister, making him at once the most popular and most divisive choice. The former Foreign Secretary still struggles to be taken seriously by the public. Just 24% think he would be competent, compared to nearly half (49%) who disagree. And just 19% think he would do a good job at running the economy, compared to over twice that number (40%) who think he would do a bad job. If we instead look at net scores, it is the de facto deputy Prime Minister David Lidington who comes top, with 7% thinking he would make a good Prime Minister and 17% thinking he would make a bad one, a net score of -10. But this is merely a factor of him being the least known, with 60% saying they don’t know enough about him to say. Home Secretary Sajid Javid has a very similar net score of -11, and is also better known with just 34% of the public saying they don’t know enough about him to say. 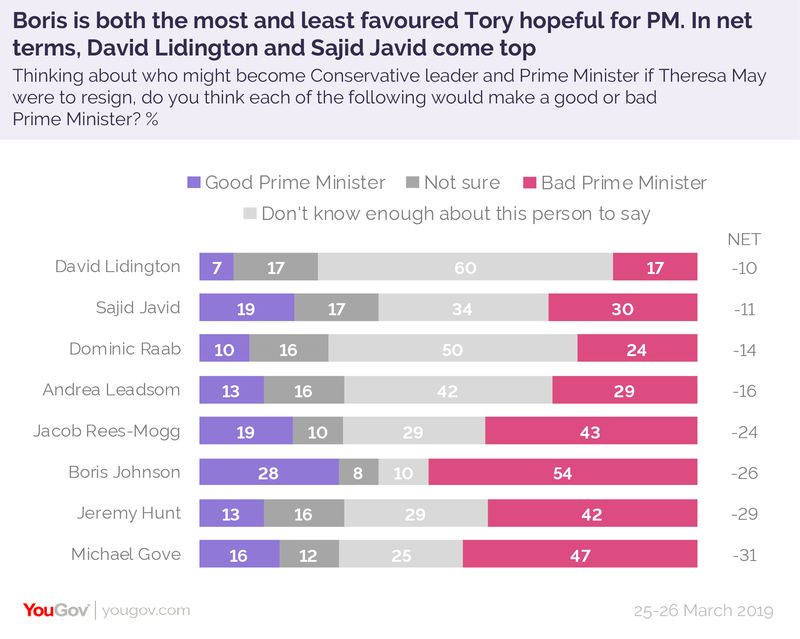 Crucially, Javid is the only contender to not have negative ratings amongst either Conservative Leave voters or Conservative Remain voters, which will put him in a good place to hold together a fractured Conservative coalition. At the other end of the scale Michael Gove has the worst net score at -31. But of course, if a full leadership election is called, public popularity will be less important that the views of around a hundred thousand members of the Conservative party. In our polling of them for Queen Mary’s university before Christmas, Boris still came top as member’s first choice, with 20% selecting him, followed by Jacob Rees-Mogg on 15%.